The Dome has been nominated for the second consecutive year in the Best Sport and Recreation Facility category at the Sports Industry Awards. The awards take place on 26th March at the One and Only Royal Mirage in Dubai where we hope to improve on last year’s Bronze Award. After such a successful visit from Graeme Le Saux it was time for the former Manchester United defender Ronny Johnsen. Ronny came from the glorious Treble winning Era gracing the Dome and Repton school with his presence on Tuesday, October 2nd. The Big Norwegian claimed to the Rawdhat boys that the Dome was by the better quality facility comparing to “the Cliff” which at the time was Manchester’s first team training ground. Johnsen then took part in the MUSS coaching clinic passing on valuable advice to the youth about his path to success as well as the message to always enjoy your football. Overall, Johnsen very much enjoyed his first visit to the UAE deciding that the Dome was a landmark for his next visit. On Thursday the 27th of September the Dome was graced with the company of Ex Chelsea and England defender Graeme Le Saux. Le Saux was silently impressed with what the facility had to offer to football fanatics in the Abu Dhabi region! The veteran then became acquainted with the Rawdhat U17 team filling them in on his pathway to success and the locker room stories from over the years. The Rawdhat team then invited Le Saux to join their afternoon practice which was both an honor as well as an opportunity to learn from the man himself. After leading the team huddles and passing down some wise words, Le Saux then gave his gratitude to the boys for receiving the Rawdhat Club top with his name and number. Abu Dhabi, UAE, 16 September 2012: At the height of summer strenuous activity is the last thing on most people’s minds but not so for the Falcons Football team. Hosted by Reem Investments a selection of players will play non-stop for 24 hours against a number of guest teams. GoFor24 in conjunction with Operation Smile, which is under the patronage of Her Highness Sheika Al Yazia bint Saif bin Mohammed Al Nahyan wife of His Highness Sheikh Abdullah bin Zayed Al Nahyan the Minister of Foreign Affairs, and with a select group of players representing Falcons Football Club will host and play from 21 to 22 September, 2012. The game will be kicked off by His Highness Sheikh Abdullah’s two sons Mohammed and Zayed. The series of 9-a-side games means the host team has to have representation at all times during the 24 hours as guest teams come and go. The event is part of GoFor24, a not for profit organisation behind a global initiative to hold 24 hour football matches around the world. GoFor24 is a vehicle to use the global reach of football to support and raise much needed funds for various charities worldwide. Morag Cromey-Hawke, Executive Director of Operation Smile UAE, said “We are aiming to raise around AED 500,000 for Operation Smile UAE. The international children’s charity provides free and safe reconstructive surgeries for children and young adults born with a cleft lip, cleft palate and other facial deformities. The surgery can take as little as 45 minutes and costs just AED 880 and will change their life forever. For further information on Operation Smile visit www.operationsmile.org.ae. For more information on GoFor24 email John.Hassan@GoFor24.co.uk or visit their website www.GoFor24.co.uk. The Dome@Rawdhat was built by Reem Investments to create a vibrant sporting community at the gateway to Abu Dhabi. The area has become a magnet for players of all ages, currently hosting more than 18,000 footballers and their families every month on its indoor and outdoor pitches. For more information on upcoming events or hosting your very own tournaments at TheDome@rawdhat, visit www.thedome.ae or call 02 4470 754. For live, up to date information follow @thedomerawdhat on twitter or become a fan at the dome@rawdhat Facebook account. 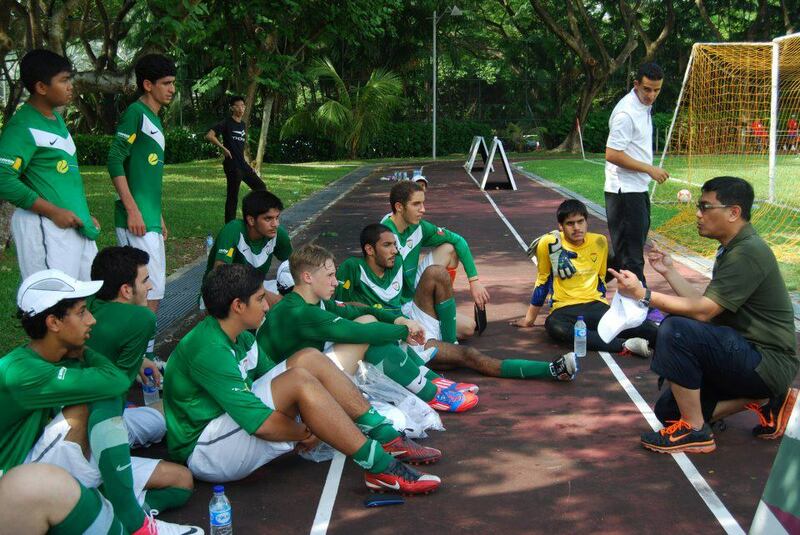 Seven boys from Abu Dhabi Rawdhat Football Club were invited to attend trials at the Geylang United Football Club from August 23 to 27, 2012 in Singapore. Geylang United is an S-league Club steeped in history. Under the new chairmanship of Mr. Leong Kok Fann, Geylang is in the process of re-building with particular focus on youth development. The Dome@Rawdhat was built by Reem Investments to create a vibrant sporting community at the gateway to Abu Dhabi. The area has become a magnet for players of all ages, currently hosting more than 18,000 footballers and their families every month on its indoor and outdoor pitches. 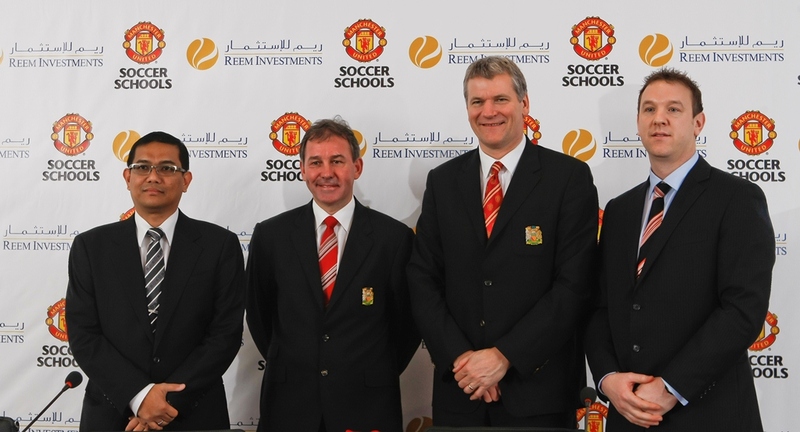 Dubai, UAE, 9 September 2012: Manchester United Soccer Schools (MUSS) has announced a major new signing right here in Dubai which will see hundreds of budding footballers learn to play the United way. One of the most respected soccer schools in the world, MUSS has been successfully teaching UAE children how to play the United way at its home in Abu Dhabi since 2010, and now, the programme is extending to Dubai after local partner Reem Investments signed an agreement with Repton School to host their programs. ‘Combine to Attack’ kick starts in Dubai on Friday 5 October and will teach boys and girls aged seven to 16 the specific skills and techniques of Manchester United’s first team greats, Paul Scholes, Tom Cleverley and Michael Carrick.Children in Abu Dhabi will also learn the same techniques displayed by the central midfield trio with their 10-week programme on Saturday 29 September at the Dome@Rawdhat. Andy Dixon, Head Coach at MUSS Dubai added, “The children will learn the same techniques displayed by the Manchester United player’s and have the opportunity to develop these techniques in small sided game situations. “Everything we do at MUSS relates back to the Club’s first team players. We believe that this is a very effective way of gaining understanding and getting positive results from the children. Hosting a world-class football programme is especially fitting for Repton School, where sport plays an important role in each child’s development. “We have state of the art sports facilities at Repton and the school places a lot of emphasis on physical activity as an important part of each pupil’s day,” said Jonathan Hughes-D’Aeth, Headmaster of Repton School. All children enrolled will take part in the MUSS series of skills challenges with the top two point scorers, from the UAE Skills Finalreceiving an all expenses paid trip to Manchester to represent the UAE in the World Skills Final at Manchester United’s Carrington training ground as well as the world famous Old Trafford stadium in 2013. Featuring 12.5 hours of on-field coaching by certified MUSS coaches, the first programme costs AED1,650 and includes an exclusive Nike Manchester United training kit and giveaway pack as well as catch-up sessions and individual player evaluation. Special discounts are available to siblings, twice a week enrolments and those who sign up for more than one 10-week course. To learn more about the MUSS programmes in Dubai and Abu Dhabi call 02 449 8480 or 050 662 7701 or visit www.manutdsoccerschools.ae. MUSS NEW season in Abu Dhabi and now courses in DUBAI!! Manchester United Soccer Schools are pleased to announce that they will be running Football training courses at Repton school, from October 2012. Repton School will be the home of the MUSS courses for children aged between 7 to 16 years from all over the UAE. Accredited and certified MUSS coaches from the UK will employ techniques similar to those used by Manchester United’s first team players to support the development of all the participants. The MUSS Curriculum is also aimed at developing social skills, applicable both on and off the field, as well as promoting healthy lifestyles. MUSS is proud to announce its new ten week program starting September 29. Sign up now and learn to combine to attack like Scholes, Cleverley and Carrick. All courses include 12.5 hours on-field coaching, exclusive MUSS Nike Training kit and giveaway pack , classroom workshop sessions, individual player evaluation, opportunities to play matches in our Monday Night Football sessions, in addition to the opportunity to win a place at the 2013 World Skills Finals and the chance to play on the pitch at Old Trafford before a Premiership game. Players can now register for twice a week training sessions. Girls only sessions are also available in the privacy of our indoor facility, delivered by MUSS female coaches. The cost for a ten week program is AED 1,650. To book a place or need more information, call 02-4470754. SIGN UP TODAY to avail the early bird discount! 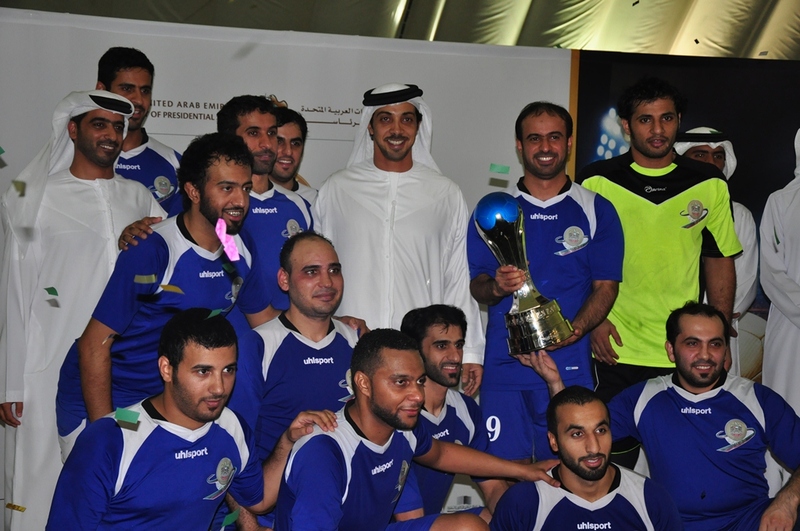 The Ministry of Presidential Affairs organized their Annual Ramadan Football Tournament at the dome@rawdhat from 18 July to 7 August 2012. The teams were divided into two categories: Abu Dhabi Judicial Department, Office of the Secretary General for the Ministry of the Presidential Affairs, UAE Ministry of Development for Government Sector, the National Center for Documentation & Research and the second category are teams under the Deputy Prime Minister and Minister of Presidential Affairs. The football tournament ended with a closing ceremony officiated by HH Sheikh Mansour bin Zayed Al Nahyan, Deputy Prime Minister and Minister of Presidential Affairs, who presented the prizes to the winners. Abu Dhabi, UAE, 17 December 2010: The coaches from Manchester United Soccer Schools (MUSS) in Abu Dhabi have announced the top 10 players from the inaugural programme during a presentation for children and their parents at the Dome@Rawdhat. More than 200 children who participated in the first MUSS module received certificates and player evaluations from their coaches while the top 10 point scorers in the skills challenge, which tested the children’s dribbling and ball control techniques, were announced. Two children from each age group will now go forward to take part in the Abu Dhabi Skills Final to take place in autumn 2011. They will be joined by 10 more participants from the MUSS module two which starts on 8 January and by a further 10 participants from module three which will begin in spring 2011. “The Skills Final challenge really tests the abilities of our players but is age-handicapped so the seven year olds can compete fairly against the 16 year olds,” said Andy Dixon, head coach at MUSS Abu Dhabi. The first ten winners characterise the true multi-cultural nature of the MUSS programme in Abu Dhabi. The GCC and Middle East is well represented with boys from the UAE, Qatar, Yemen, Jordan, Egypt and Palestine winning a place to join players from the USA, Canada and France. Abu Dhabi based developer Reem Investments, which has signed a partnership agreement with MUSS, built the Dome@Rawdhat in order to create a vibrant sporting community in the area. Reem Investments have the exclusive rights to extend the MUSS programme across the GCC. The second MUSS course kicks off on Saturday 8 January, 2011 and will focus on the specific challenges and techniques required to master the midfield positions on the pitch. ‘Learn to Control and Create the United Way’ will highlight the signature moves of current Manchester United midfielders Ryan Giggs, Paul Scholes and Darren Fletcher with children learning specific techniques such as the Scholes’ ‘stop turn’.